After quite enjoying the first Ice Age, I looked forward to MELTDOWN. Back are John Leguizamo, Raymond Romano and Denis Leary, and that goofy squirrel ever chasing his illusive acorn. This time around add to the voice cast Queen Latifah. Though his camera/mic time is unfortunately limited, I enjoyed Denis Leary as the Sabor-toothed tiger of few words. But it's absolutely John Leguizamo who deserves immense praise for the success of this project. His voice is persistently personal, ever loveable despite his character's lonely desperation. John is an interesting and versatile talent, I've seen him bomb, and I've seen him beam -- here he nails his character to the screen and to our hearts. Perhaps mostly known as a comedian, he delivers an incredible performance in a rather dark disturbing film Summer of Sam -- it's one heck of a contrast to ICE AGE. Further praise is due to the designer of John's character's visual. Sid the Sloth is the perfect mix of ugly and adorable. Meltdown is actually dialogue driven, but there's still plenty of site gags (and other sites) to keep the kiddies amused. Warm-hearted for a production with so much ice, the picture takes a shot at your funny bone at every chance, but also has the depth to tug on a few heartstrings. A bit spotty in the early goings and there's almost a stall in the middle, but from there on in it takes off toward climax and never looks back. A lot of fun. 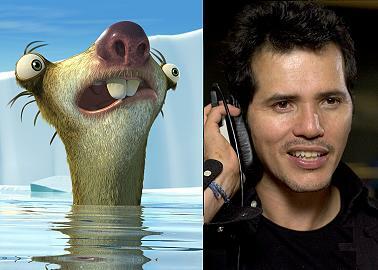 Ice Age The Meltdown. Copyright © 2006. Starring Georgie Henleyc Skandar Keynes, William Moseley, Anna Popplewell, Tilda Swinton, James McAvoy, Jim Broadbent, Kiran Shah, Liam Neeson. Screenplay by Ann Peacock, Andrew Adamson, Christopher Markus, Stephen McFeely Based on the book by C.S. Lewis.